My friend, David, and I were big fans of Twin Peaks, the early-nineties TV series that featured cherry pies, logs, and owls. A popular catchphrase from the show: "the owls are not what they seem". It took half an hour in the winter rain to set up this photoshoot before HooWoo dove off the tree, bounced off some bushes and landed in mud. I had to reshoot on the following rain-free day. 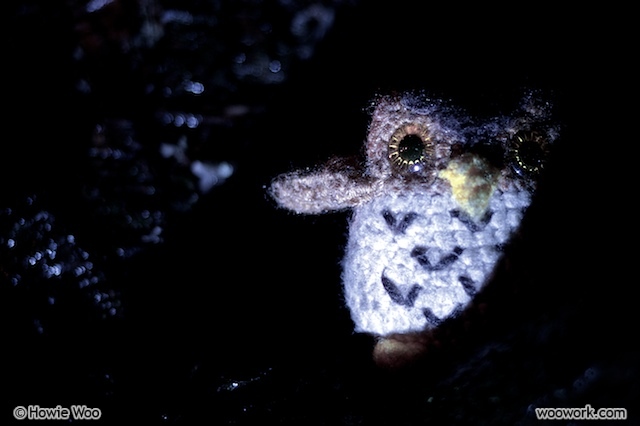 i love this owl and i love twin peaks too! 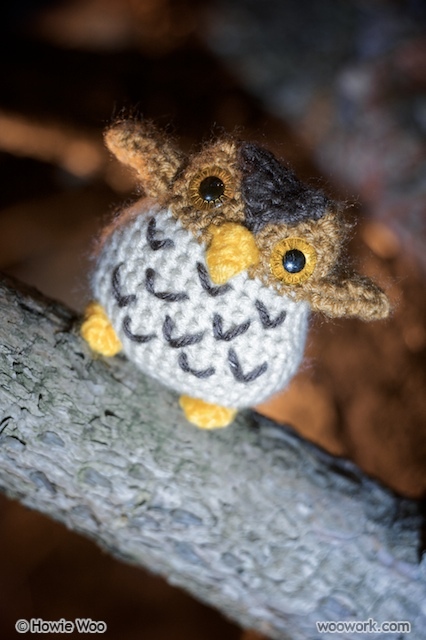 do you have a pattern for the owl or do you make all your creations as you go along? Thanks Alison! Twin Peaks was such a thrilling show, I agree. You're right that I make my creations as I go along (I sketch them out and slowly try to match the sketch), but I have recently started to take notes. Hopefully, I'll soon be able to share some patterns! Thanks again for writing! Of course you're a Twin Peaks fan!! We seriously need to be friends. Lindsey: Yes, we Canadian Crafting Twin Peaks fans should also form a club ;) C.C.T.P.F.? I am so j for jealous that you got to go to the twin peaks festival. (actually, i am happy for you)...but in 1992 i was busy having twins (not kidding) and my husband and i swear it was from watching twin peaks EVERY WEEK. and sometimes we would watch it backwards to look for bob clues. Having twins during the twin peaks festival makes you the ultimate Twin Peaks fan! ;) My piddly collection of Twin Peaks trading cards can't compare!